Life is full of trials, stuggles, and stress. It’s so easy to get bound up in all of the things that are out of our control and to just anxiously toil and struggle our way through. This morning, while reading in Exodus, I was reminded, yet again, that isn’t God’s plan for His beloved children. He has a better way for us. He calls us to trust in His plan, to rest in His provision, and to believe that He is working on our behalf. I know not everyone is as in love with the Old Testament as I am, but, trust me people, it is so full of applicable truth and encouragement! Stick with me for a minute and listen to this example. My reading this morning was centered around the time when the Hebrews were fleeing from Egypt under the leadership of Moses. It must have been chaotic. The people left in a hurry without much time to prepare. It also must have been terrifying to leave all that they had ever known for an unknown wilderness. In the midst of all of that, their enemies, the Egyptians, were in hot pursuit of them. Fear and doubt were running high! Have you been there? Maybe you’ve not been feeling from your enemies into the wilderness, but I’d be willing to bet that you’ve experienced fear and doubt. I would guess that you’ve felt like you were struggling looking for answers. I’m sure you’ve looked into the unknown and wondered how on earth God could have led you to the place you found yourself and how in the world you could safely make it through the trials you were facing. That’s about as simple as you can get, yet it’s one of the most difficult things to do. It must have been so hard to trust God and walk across that sea, but as always, God came through. He stood between the people and their enemies. He provided an escape. He crushed their enemies. He kept his promise and fought for them. All they were required to do was to trust Him and obey His command. Lord, help us to be able to do the same. Help us to be able to claim that promise in the middle of seasons of chaos, fear, and doubt. Calm our hearts. Help us to cast out cares at your feet. 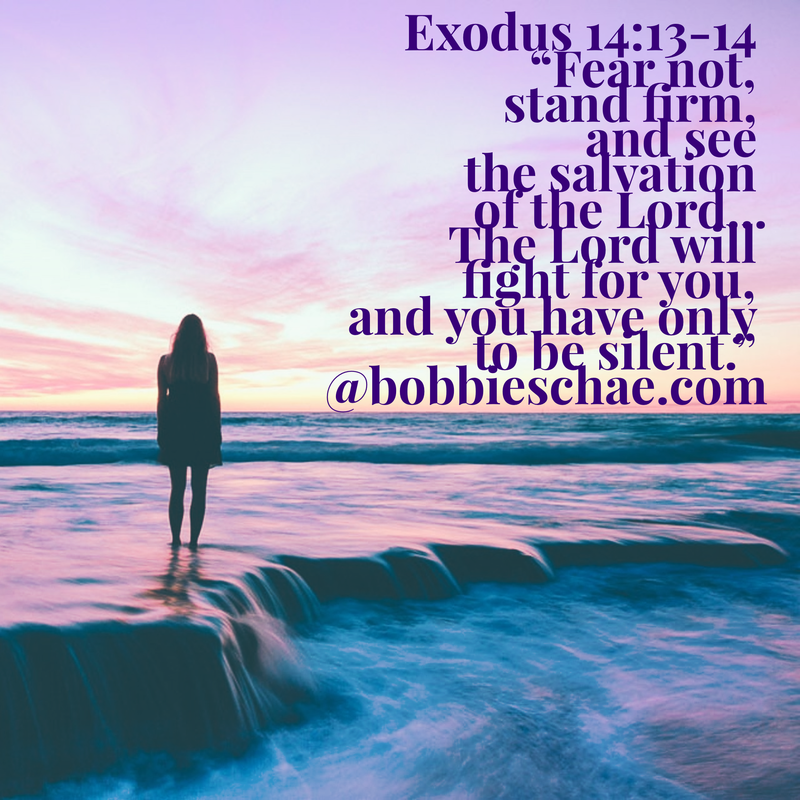 Remind us to not be fearful but to stand firm because we know that you fight for us. Give us the wisdom to not anxiously toil and struggle, but to be silent and trust in you. Copyright 2018 Bobbie Schae. All Right Reserved.